t ice age. The order Cyatheales, which includes the tree ferns, is a taxonomic division of the fern class, Polypodiopsida. No clear morphological features characterize all of the Cyatheales, but DNA sequence data indicate the order is monophyletic. Some species in the Cyatheales have tree-like growth forms, but others have creeping rhizomes (stems). Some species have scales on the stems and leaves, while others have hairs. However, most plants in the Cyatheales are tree ferns and have trunk-like stems up to 20 meters tall. It is unclear how many times the tree form has evolved and been lost in the order. Equisetum (pron. : /kwsi?t?m/; horsetail, snake grass, puzzlegrass) is the only living genus in the Equisetaceae, a family of vascular plants that reproduce by spores rather than seeds. Equisetum is a "living fossil", as it is the only living genus of the entire class Equisetopsida, which for over one hundred million years was much more diverse and dominated the understory of late Paleozoic forests. 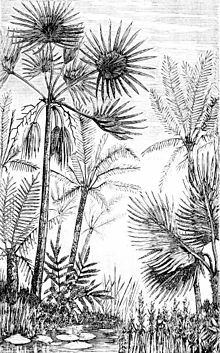 Some Equisetopsida were large trees reaching to 30 meters tall; the genus Calamites of family Calamitaceae for example is abundant in coal deposits from the Carboniferous period. A superficially similar but entirely unrelated flowering plant genus, mare's tail (Hippuris), is occasionally misidentified and misnamed as "horsetail". It has been suggested that the pattern of spacing of nodes in horsetails, wherein those toward the apex of the shoot are increasingly close together, inspired John Napier to discover logarithms.